Hugh MacMillan is a poet whose work often focuses on the culture and history of his home region of Dumfries and Galloway. He has had six poetry collections published, as well as numerous booklets. At this event he will launch his latest collection “Conversation With Sheep”. Browse more than 20 stalls showcasing a selection of the best food, drink, art and crafts from across Galloway. Visit Santa for an early Christmas gift, and enjoy light refreshments in the Kist Tearoom. Join Gatehouse of Fleet story teller and singer Susi Briggs, especially good for weans, or those in touch with their inner wean. Poet and storyteller Sandy McKnight from the Rhins, entertains with children’s stories. Sandy McKnight tells the gruesome tale of Sawney Bean, but in this version, one of them survives! 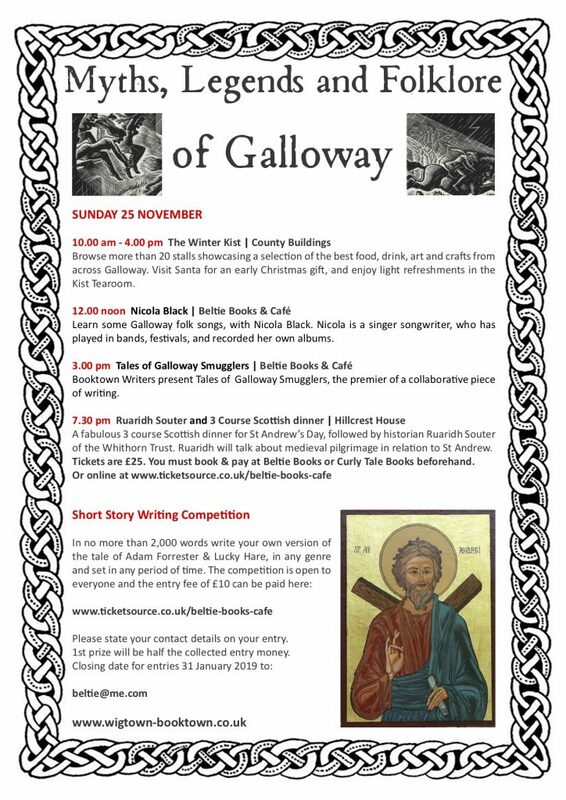 Learn some Galloway folk songs, with Nicola Black. Nicola is a singer songwriter, who has played in bands, festivals, and recorded her own albums. 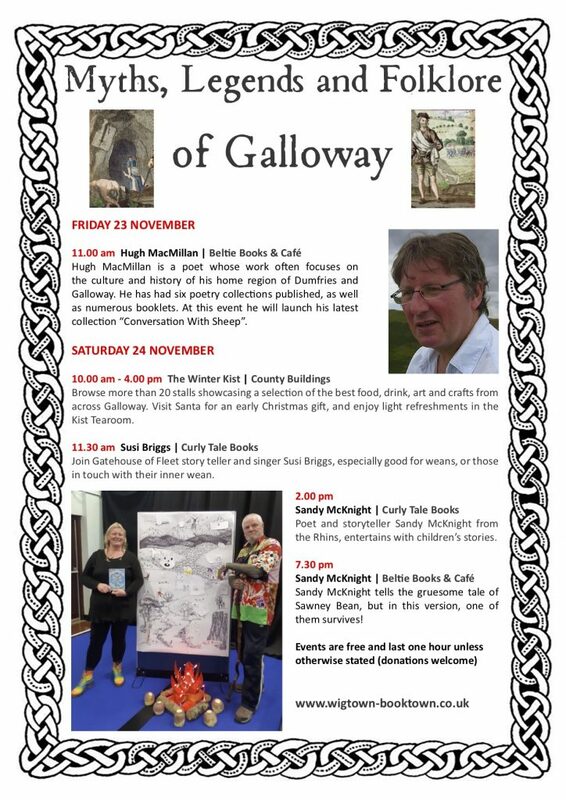 Booktown Writers present Tales of Galloway Smugglers, the premier of a collaborative piece of writing. A fabulous 3 course Scottish dinner for St Andrew’s Day, followed by historian Ruaridh Souter of the Whithorn Trust. Ruaridh will talk about medieval pilgrimage in relation to St Andrew. Tickets are £25. You must book & pay at Beltie Books or Curly Tale Books beforehand.